Dubai Captain Aaron Finch warned Australia will embark on their World Cup defence next month with confidence riding high after completing an ODI sweep against Pakistan on Sunday hot on the heels of a series victory in India. Written off after a torrid 15 months which saw Australia win just three of 18 one-day internationals, Finch led the 2015 World Cup winners from 2-0 down last month to beat Virat Kohli’s formidable side 3-2, Australia’s first series win in India since 2009. They then romped to a 5-0 rout of a depleted Pakistan who rested six top players for the series played in the United Arab Emirates, including regular captain Sarfraz Ahmed, ahead of the World Cup which begins on May 30. “We’ll go to the World Cup with a lot of confidence now, even after a lot of people wrote us off,” said Finch who was declared man of the series for his 451 runs including two hundreds and two fifties. “Potentially we had a real focus coming here and that was our last hit-out before the World Cup so we wanted to go into that tournament with a lot of momentum,” he said after inflicting a fourth whitewash on Pakistan in a bilateral series. Winners of 2015 World Cup at home, Australia had endured a miserable time in limited-overs cricket since last year’s ball-tampering controversy in South Africa. 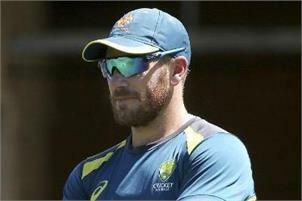 Finch admitted the potential return of Warner, who has been in top form in the Indian Premier League, and Smith would mean some difficult choices when the World Cup squad is named later this month. “There will be some unlucky guys,” said Finch of squad that could also see the return of fast bowlers Mitchell Starc, Jos Hazlewood and Pat Cummins after injury. “Everyone who has an opportunity has played some great cricket. At the end of the day there will be some tough calls, but its exciting for Australia at the same time because six month back a lot of people were slamming us. Pakistan’s head coach Mickey Arthur, who has also coached South Africa and Australia, said the defending champions were in good shape. “All the final jigsaw pieces are coming together nicely. Australia look a very, very good side. They will be a threat at the World Cup,” said Arthur. Arthur defended leaving out key players Babar Azam, Fakhar Zaman, Hasan Ali, Shaheen Shah Afridi and Sarfraz, while Mohammad Hafeez was missing injured. “All we can do is prepare as best we can,” he said. “We got on the road in September last year for the Asia Cup and then went to South Africa and then had the Pakistan Super League so we had to rest them.